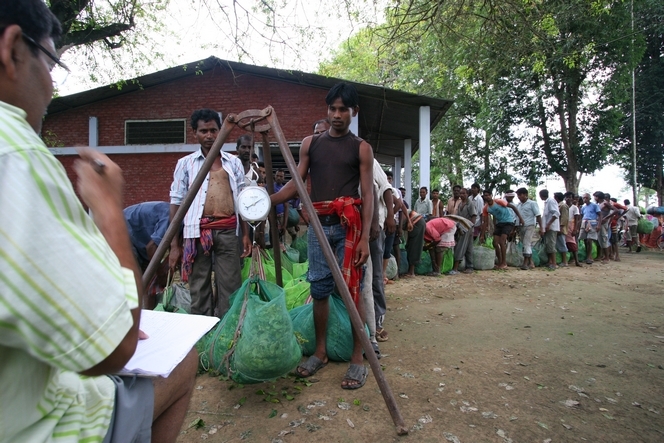 In the middle of the day, as soon as the plucking is finished, the workers gather to get their bags weighed. Here, at Dufflating (Assam), everyone waits in turn and one by one hangs their bag of tea leaves on the mobile scales. The supervisor records the worker’s name and the weight of the bag, which will determine the pay for that day. You can see that the bags are made of netting, to prevent the leaves from oxidising. They must remain in perfect condition all the way to the factory, otherwise the tea will be spoiled.